I was completely intrigued by Rafa and Gaby’s relationship. I mean, I was very intrigued by Gaby and her past, but I really want to know what went down between her and Rafa. There are many references to tension in their past, but you don’t know why. I’m extremely interested to see how all that pans out. I appreciated that the romance was supplemental rather than the primary conflict. That’s not to say it wasn’t there. It was an integral part of the story, but it added to the plot rather than taking over it. Don’t get me wrong, I love a good straight romance book every now and then, but I normally like a good balance of plot and romance or relationship building. Shadows did an excellent job at this. There were quite a few surprises throughout this book. It felt like every few chapters, something new and shocking was revealed, which easily kept me interested. There’s a lot of mystery surrounding Gaby and her brother Jude, and their respective relationships to all the other Nephilim. Weston does a good job of world building, giving us enough information to really grasp what’s going on, but leaving enough unsaid to keep us interested and asking questions. None of the secondary characters really stood out as fabulous to me, but that’s not to say that I didn’t like them. Rafa and Gaby were the most interesting to me. Neither of them seemed really typical to me, so they were pretty fun to read and imagine. High stakes throughout made this a fast read for me. There were some exciting action/fight scenes, when things really started heating up with the Nephilim. And of course, a good bit of romance. 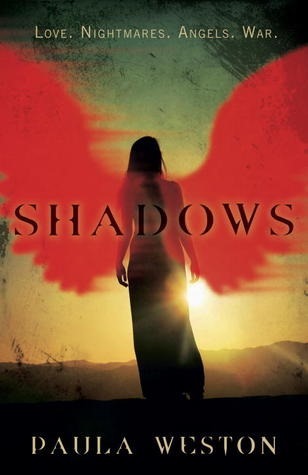 All these together make this dark novel about angels and their half-human descendants a quick and very entertaining read. This entry was posted in Book Reviews, Fantasy, Paranormal Romance and tagged Fantasy, New Adult, Paranormal Romance.